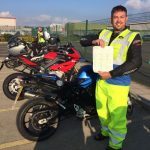 Our motorcycle lessons are tailored to suit you, ensuring that you have the best motorcycle training available and increasing your chance of passing your motorcycle test first time! We are one of the only training schools in the area possibly the country with an indoor training pad. The advantages of this are obvious, particularly in the winter or on rainy days,which lets face it we get lots of here in the UK. "Fantastic bunch of lads, I'd never even gotten on a bike before. They had me feeling confident in no time. Enjoyed my day there. I would highly recommend!!" "Can't praise them enough.Enjoyed every minute and got me through my direct access at first attempt. " "I did my CBT with Big Mick and it was a great experience. Really enjoyable and relaxed. Mick was absolutely brilliant - I couldn't recommend him highly enough." 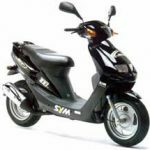 "I have recently passed my CBT with KK training. Both instructors were really nice and approachable both enthusiastic and very funny! They made me feel relaxed and comfortable. Would highly recommend to anyone. " "Really good instructors that know what they are doing! Passed my CBT course today and must say they were excellent! " 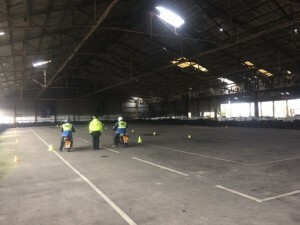 "Great instructors brilliant day, would really recommend to anyone who need to pass cbt test, cheers"
" Excellent bunch of lads, past my mod 1 and 2 first time with zero faults, and had a ball along the way."